NEWARK, N.J. -- New Jersey left wing Andrew Peters will not suite up against the team he previously spent five seasons with on Wednesday when the Devils play host to the Buffalo Sabres at Prudential Center. Peters, who totaled 4 goals, 7 points and 557 penalty minutes in 200 games with Buffalo from 2003-04 through 2008-09, admits he had a feeling coach Jacques Lemaire would stick with the same lineup he had in Pittsburgh. "I kind of had the feeling because we won the last game and I knew he'd stick with the same lineup pretty much," Peters said. "You do this for as long as I have and you kind of know when that time's coming and I understand. They told me if we won last game it would be the same lineup, so it's no big deal. I just have to stay ready for the next one." Peters said he isn't disappointed or angry that he isn't given a chance against his former teammates. "I'm disappointed when I don't play," Peters said. "You want to play every game. I don't look at this game any differently than any other game other than the fact I did play there for five years and I know a lot of those guys but there's no more disappointment because it's Buffalo. That comes with my role; that's what I signed up for. I know I'm not going to play every night. I'm just happy to be in this League for as long as I have been and it's even an honor to be scratched from an NHL game -- I could be in the American (Hockey) League." Devils coach Jacques Lemaire said the fact his club is facing Peters' former team had nothing to do with their decision. "Sure, he has a lot of friends over there and maybe that would be a distraction, but it had no meaning on our decision tonight," Lemaire said. Peters has no points, 9 penalty minutes and a minus-1 rating in four games with the Devils this season. 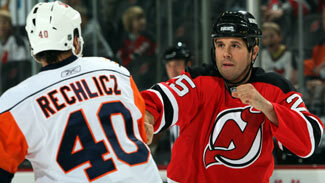 NEWARK, N.J. -- The New Jersey Devils have scripted this book before. Remember when four-time Vezina Trophy winner Martin Brodeur was sidelined three-to-four months after tearing his left biceps tendon while trying to make a glove save during the first week in November 2008? Despite losing their heart-and-soul, the Devils would persevere and win 32 of the 50 games Brodeur missed behind the play of backup Scott Clemmensen. Well, it's that time again, but only this season the bad news centers around their top defenseman, Paul Martin, and one of their best penalty killers in left wing Jay Pandolfo. Both players are expected to miss four-to-six weeks after suffering injuries in a 4-1 victory over the Pittsburgh Penguins on Saturday. "For sure, (Paul) Martin is our No. 1 guy on defense because he logs a lot of minutes, so it's tough to replace him but, on the other hand, we still think we have a solid D-corps," Devils defenseman Johnny Oduya said. "Obviously, some guys will have to step up and play some more minutes but that's part of the game and it's something you have to get over." The pairings at Wednesday's morning skate had Oduya with Colin White, Bryce Salvador with Mike Mottau and Mark Fraser with Andy Greene. Devils coach Jacques Lemaire wasn't about to show his hand on who would replace Martin at the point on the power-play though. "Somebody will replace him," Lemaire said. "If it's not (Johnny) Oduya, it'll be another one." The absence of Pandolfo also forced Lemaire to shuffle his forward lines which consisted of Niclas Bergfors-Travis Zajac-David Clarkson; Zach Parise-Dainius Zubrus-Jamie Langenbrunner; Brian Rolston-Rob Niedermayer-Matt Halischuk; Pierre-Luc Letourneau-Leblond-Rob Pelley-Ilkka Pikkarainen. Of course, there's a very good chance adjustments will be made early and often. Defenseman Cory Murphy, who was assigned to Lowell in the AHL on Oct. 20 but recalled and was practicing on Wednesday, will be a healthy scratch. Lemaire feels losing Martin and Pandolfo doesn't necessarily mean other players will have to log more minutes. "The guys just have to do things a little better," Lemaire said after Wednesday's morning skate at Prudential Center. "You don't change your approach to be better in what you're doing. The only time you try to change things is if you're not having success. Power play is an example -- if you don't have success you got to change something and try something else and quick because you're just going to get worse. You've got to find a solution that players will get confidence." Martin, who was and probably still is a lock for the 2010 U.S. Olympic Team, was diagnosed with a non-displaced fracture in his left forearm. He was leading the Devils in ice time per game (23:57) at the time of his injury. Pandolfo, who was averaging the third-highest minutes on the team's penalty-killing unit this season, is sidelined with a dislocated shoulder. Devils President/CEO/GM Lou Lamoriello discussed the significance of the injuries at a media gathering during his team's morning practice Monday in preparation for Wednesday's home game against the red-hot Buffalo Sabres. "There's no question what they bring to the lineup," Lamoriello said. "Paul, certainly, what he brings to defense, and Jay, what he brings to penalty killing and leadership and 5-on-5 defensive situations. But you just cannot put it as anything other than it's a part of the game. When these things transpire, other people get opportunities. What you hope is that players take advantage of those opportunities and make the most of it. That's all you can do. You can't look at it any other way. We all know what type of players both of them are." The injury to Martin, who entered 2009-10 averaging 75.6 games over his five seasons with New Jersey, certainly puts a crimp into the defensive scheme. Still, Lamoriello is confident the team will rise up to the challenge. "You start with the coaching staff," he said. "This is a mature and experienced coaching staff. You look at the players, and they know what injuries are about; they know they're a part of the game. No one wants to see it happen, but you can't think about anything other than what your responsibility is and what your job description is and do it."